The quest for happiness in a life that felt out of control led the singer Jewel to turn inward early on. Now she’s sharing what she learned with the world. South Las Vegas Boulevard in mid-May is blindingly bright and has far more traffic than I’d expect on a weekday afternoon. As I maneuver my red Yaris among the taxis, Ubers, and much fancier rentals than my own, I’m mystified why there are so many people out on the Strip midday on a Thursday. groups of tourists posing for photos. I’m having a hard time keeping my eyes on the road and realize too late that I’m in the wrong lane. I floor it to move over, and zoom through the light before it changes, throwing a feeble, “I’m sorry! I don’t know where I’m going!” wave to anyone I may have pissed off. I can feel my nerves crackle and my palms begin to sweat. Ironically it’s mindfulness that brings me here. I’ve come to meet Jewel, the singer-songwriter whose 2016 memoir Never Broken: Songs Are Only Half the Story shared with the world the many mindful practices she developed as a teenager to help deal with the anxiety, fear, and insecurity she struggled with since childhood. These practices remain an essential part of her life today. Now she wants to teach others that they, too, can change their experience of life, no matter where they start from, and find their own happiness. 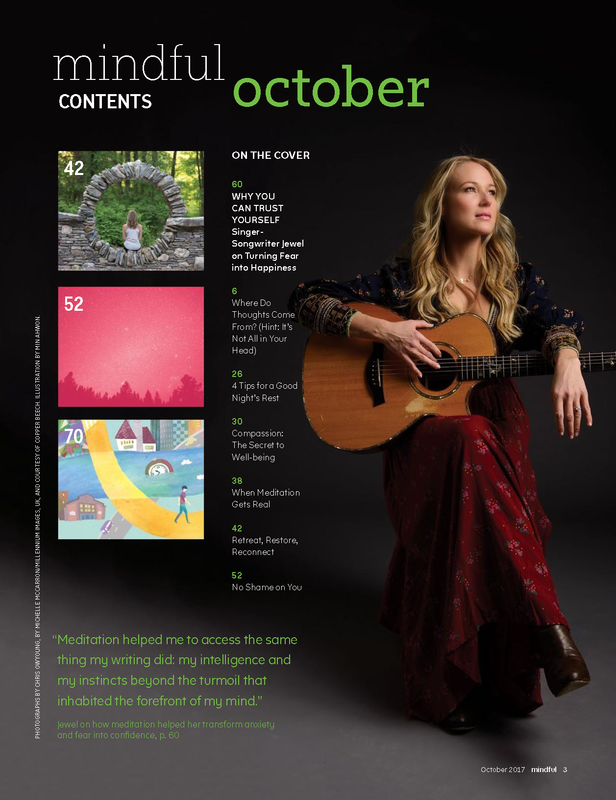 Although it’s been more than 20 years and 11 albums since her debut record, Pieces of Me, to many Jewel is still best known as the soulful singer-songwriter with an impressive range (she yodels, no less) from Alaska, discovered at age 19 playing in a San Diego coffeehouse while living out of her car. But as the book title hints, there’s much more to this story. 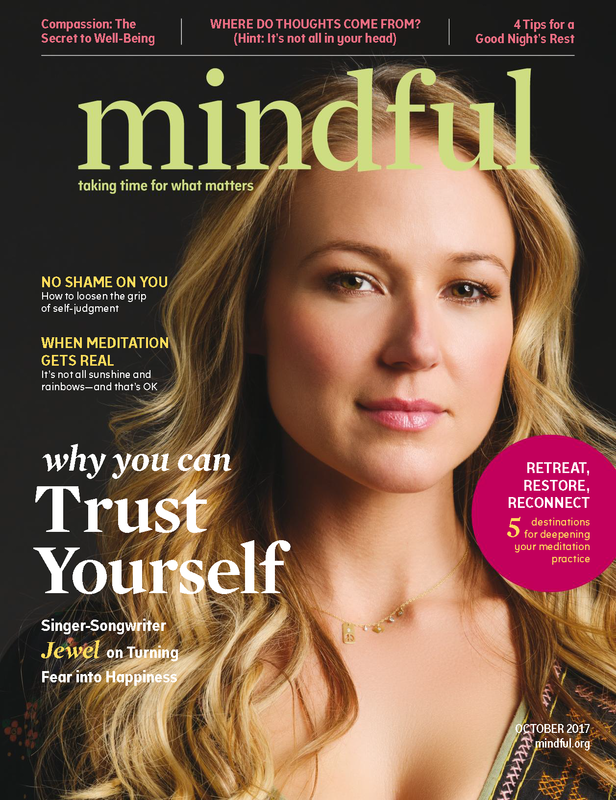 And this unlikely clickbait town is the surprising base for an ambitious slate of programs and projects with Jewel’s mindful philosophy at their core. I’m eager to learn more. First I need to find the Bellagio’s conference center, where Jewel is speaking and performing at SALT, a convention for the financial industry. I’m hustling; my search for cheap parking has made me run late. I cross what feels like the distance of four football fields before I finally arrive at the panel stage where Jewel is presenting with Zappos’ CEO, a mohawked Tony Hsieh. I join a standing-room-only crowd of dressed-to-impress finance men and just a handful of other women. package of sorts, to help support employees to experience greater harmony in their lives, such as developing healthier work–life balance, or enjoying better physical or fiscal health. “Happiness is a side effect of having tone in every area of your life,” she says. The program will comprise “toolkits” of best practices and strategies, online and in real time, in key areas where employees identify needing the most support. Once it’s up and running, they intend to sell the program to other organizations. to introduce mindfulness into public school language arts programs, and a plan for a cartoon, to teach mindfulness to preschoolers. I learn that Cirque du Soleil is making a show about her life. But mindfulness—and let’s face it, the pairing of Tony Hsieh and Jewel on one stage—has a bit more dazzle than hearing about the pros and cons of liquid alternative strategies in your portfolio. 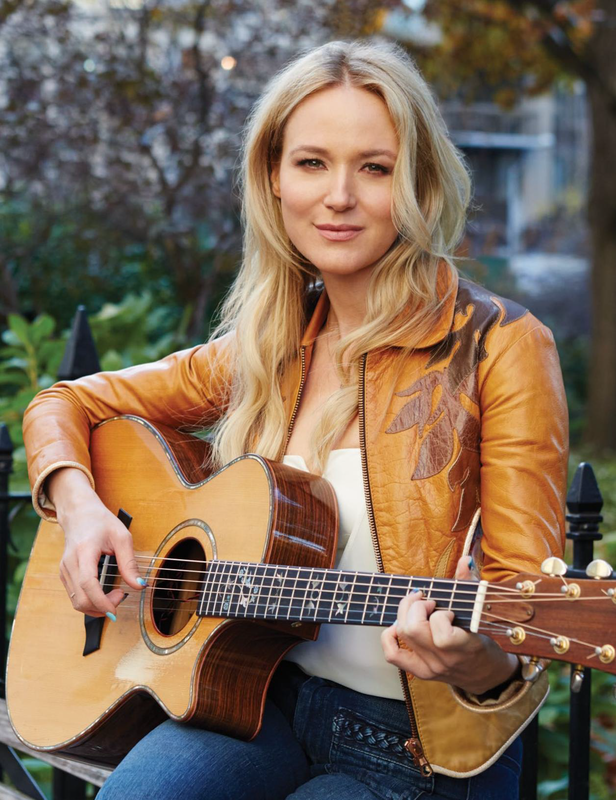 Jewel is pivoting, as they say in the start-up vernacular that infuses her world these days. Over the next week I’ll hear about programs in “beta,” about the entrepreneurial spirit, and about metrics—or, rather, how to not base creative ideas on these measurements. There’s even a meeting with Apple cofounder Steve Wozniak, who, it turns out, is a friend. for the periodic whispers of her 6-year-old son, Kase, who keeps popping in to visit. The calm that pervades seems to be by design: Jewel confirms that the busier she is, the more still she gets. In between performances, appearances, and business meetings this past week, she’s been meditating three times a day. 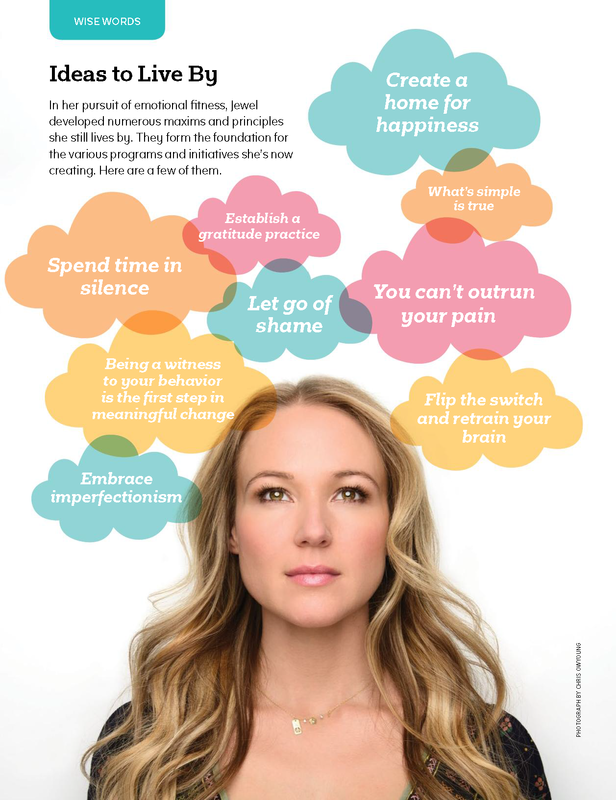 While her turn as a mindful influencer may seem surprising, the truth is, Jewel has never followed the obvious path. As a musician, she comfortably slides in and out of folk, pop, and country genres. She independently produced two albums of lullabies and has written children’s books. She acts. And she’s taken big chunks, years even, of time off between projects, a highly discouraged move in the music industry. “I wouldn’t recommend it if you want to stay on the album charts,” she says wryly. honkytonks throughout Anchorage with the family act, and an affinity for Socrates, Plato, and the work of Charles Darwin despite suffering from serious dyslexia. It was also unstable and increasingly abusive. After Jewel’s mother left when she was 8, she and her two brothers were raised by her father. 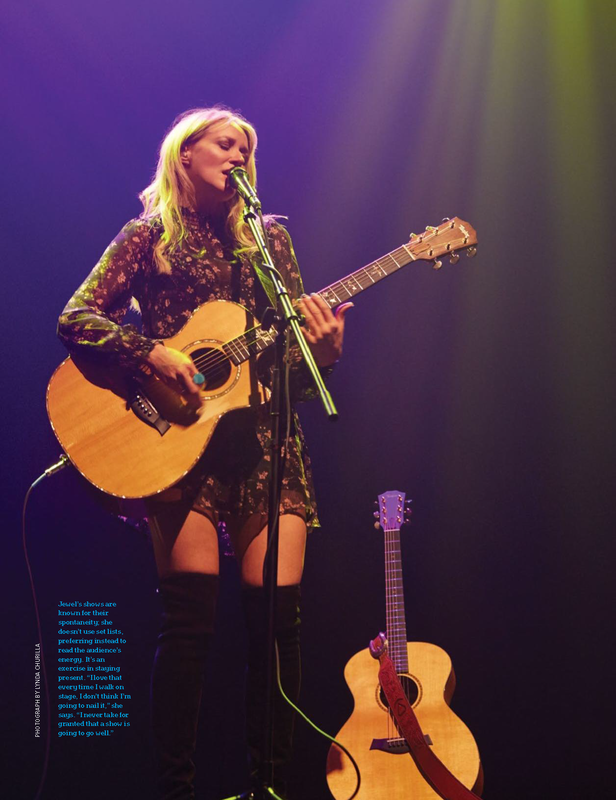 Life as a musician wasn’t easy, and her dad turned more and more to alcohol, Jewel writes, leading to explosive bursts of anger and physical abuse, which prompted Jewel to move out at age 15.
brought on by the pressure of being a teenager trying to navigate the adult world. Journaling (something she had done since childhood), meditation, and visualization helped. She left Alaska after earning a scholarship to a performing arts high school in Michigan her junior year. During school breaks, lacking the funds to go home, she would “hobo” around— bus, train, and hitchhike—guitar in hand, and write songs along the way. One time, she made it all the way to Mexico and back. She was 16. Following graduation, Jewel headed to San Diego. After turning down the advances of a creepy employer and subsequently losing her job, she could no longer pay rent and ended up living out of her car. She shoplifted food, struggled with agoraphobia, and suffered from chronic kidney infections. She was poor, sick, isolated, and depressed—exactly where she had determined she would never be. “curating” healthier thoughts. Each day she began noting any little thing she could feel grateful for. She practiced replacing negative thoughts with positive ones. It worked. “My anxiety began to calm down, one thought at a time,” she says. “I didn’t know what mindfulness was. Nobody did back then that I was aware of. I developed these exercises of necessity,” she explains. “It was just, I need solutions that work so I have a better experience of life, because I was really unhappy and tremendously uncomfortable. And once again I’m awed by the power of mindfulness. To think that this beautiful, intelligent, and grounded woman once felt so alone and traumatized with fear that she was afraid to get out of her car—and yet was able to find confidence, courage, and, yeah, happiness, by tuning into her thoughts and challenging those that kept her feeling diminished, deeply moves me. 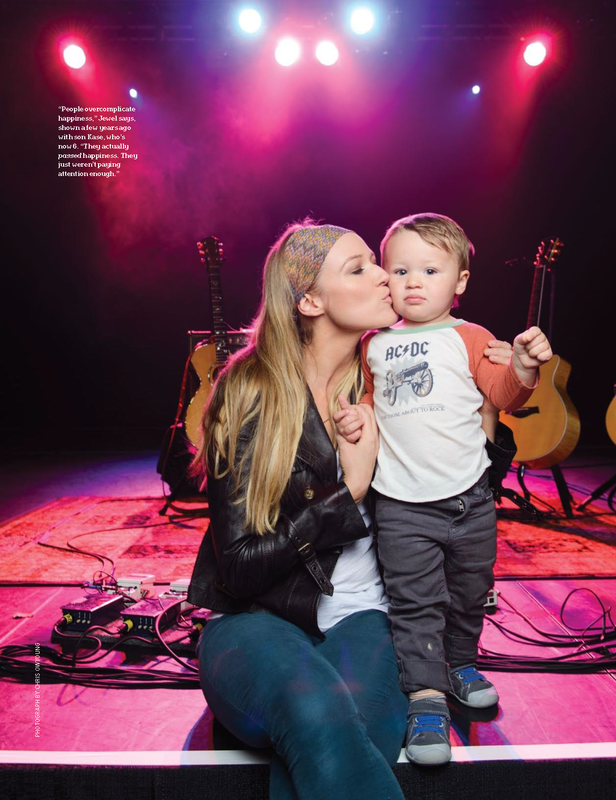 Now 43 and mom to her bright and curious son with ex-husband Ty Murray, a retired rodeo star, Jewel has far different concerns—like how to raise a down-to-earth kid in the midst of celebrity privilege, how to maintain her career without having to tour all the time, and how to make a larger contribution in a way that feels authentic and useful. being happy and healthy—in mind and body—before the pursuit of money or fame, something she recognized from the beginning as a “trap,” she says. to be a passenger in a life they inherit,” she says. A few days later, I’m at a high tea put on by the kids in the foundation for its supporters, where Jewel is the featured guest. One of the girls, a 15-year-old who came into the program after trying to commit suicide, stands up and talks about this song. “I feel like I’m finally understanding that, like, life bringing you to your knees isn’t a bad thing, that those moments where you are overdrawn really are times of growth, and that I’m lucky to have them,” she says. Jewel isn’t the only one wiping away a tear at this. It’s clear that these kids are ripe for the practices she had to teach herself out of necessity. And that’s just what she hoped for when she embarked upon this path. That’s where the work of creating happiness begins, she says: digging through the mud and gunk that life heaps on, unwinding habits you developed out of necessity that no longer serve you, and to examine the thoughts that run your mind, to see if they’re reflecting your truth. And, importantly, paying attention to even those small moments that bring you joy. Like spending quiet time with your son. Or riding horses. Or exploring new and innovative ways to share the hard-earned wisdom you’ve gained with the hope of making someone else’s journey a bit easier. And knowing that when life shifts or knocks you flat, you can go inside, listen to what your mind is telling you, and choose a better thought. Man, copy/paste from a pdf is kinda hard, lol. Highlight: Cirque du Soleil is making a show about Jewel's life. I would go see that. Thanks Jess, this looks really nice. Might see if I can find a copy in the UK, but not 100% sure it's sold here. And yes, I sometimes have to copy from PDFs as part of my job, and it's the most tedious thing on the planet. So I really appreciate the effort! It's a chore, isn't it? I do it at work a lot, too, but it doesn't have to look good for my purposes usually. Doesn't really look good here, either - I gave up on the spacing! Sometimes I have to grab text from like five-page PDF articles, with three columns on the page, and it takes f-o-r-e-v-e-r. Still, it means I don't really have to think much about what I'm doing, so I treat it as a mental breather! Was good of you to do any of it here tbh, so thanks again. You are DEFINITELY not alone in that sentiment, Javo! I can't stand that word. I don't like any of these self-help buzz words. It's New Age nonsense in my opinion. Maybe I just notice it because of Jewel, but that word's everywhere now it seems. The whole concept is really vague to me. It's all very big right now. I work in a place that used to offer a Mindful Based Cognitive Therapy Program - people flocked to it like moths to a flame. The lady who ran it retired and there is no replacement for her in our town - it takes a lot of training for a quality teacher for this stuff. Who knew. I'm sure it has some benefit for those who need it and apply it to their lives. It's not something I personally am into.